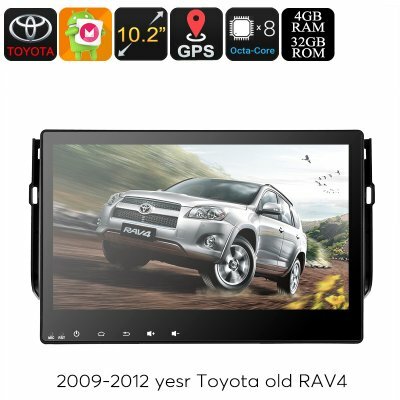 Successfully Added 2 DIN Car Stereo Toyota RAV4 - 10.2 Inch Touchscreen, Octa Core CPU, Android OS, GPS Navigation, Bluetooth, 3G&4g Dongle Support to your Shopping Cart. Take your RAV4 driving experience to new heights with this awesome 2DIN car stereo. A large 10.2-inch touch screen and CAN bus support put Android Marshmallow at your fingertips. OK Google will be you in car personal assistant and with Bluetooth technology, you can enjoy hands-free calls for a safer way to communicate while driving. Running on a Rockchip octa-core CPU with 4GB of RAM and a PowerVR GPU this android car stereo supports full HD 1080P video decoding and can even handle a variety of apps so you'll keep everyone entertained with video and games. With USB memory pen and 3G dongle support as well as global FM and AM radio you will be able to listen to your favorite movies, download music, and videos or play content directly from a USB memory device. This will keep you and your passengers entertained no matter how long the journey. A SIRF III GPS receiver brings accurate navigation to your Toyota RAV4 with that will accurately triangulate your coordinates. Using Google Maps you'll have an exact birds eye picture of your location shown on a 3D interface. As well as directions on the map, this GPS navigation unit will give clear audio directions letting you benefit from a turn by turn guide to your destination. Now you can sit back and enjoy the ride stress-free as everyone will be entertained any you needn't worry about getting lost. When it comes to audio support you'll be able to hook up four 45 watt speakers that let you enjoy high fidelity audio with great bass and rich sound quality. This 2 DIN car stereo comes with 12 months warranty, brought to you by the leader in electronic devices as well as wholesale car media players and stereos..